SACRAMENTO, Calif. — California Democrats approved a "sanctuary state" bill Saturday that would limit how local and state police can interact with federal immigration agents. 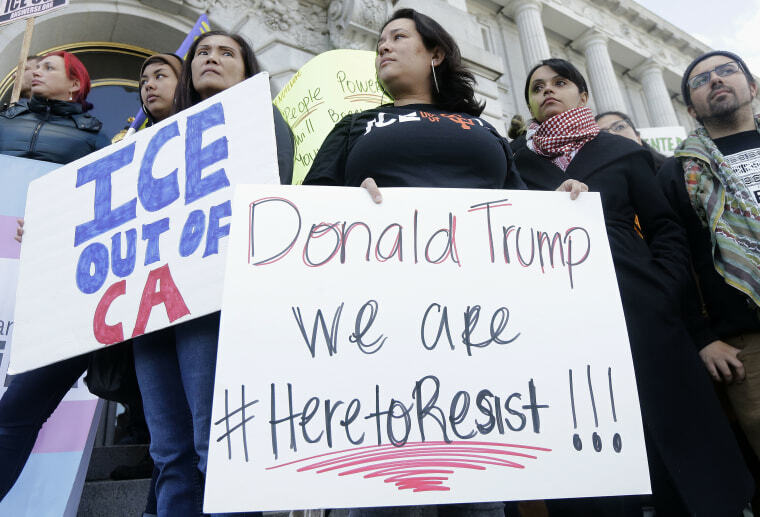 The legislation is the latest effort by Democratic lawmakers in California, home to an estimated 2.3 million immigrants without legal authorization, to create barriers to President Donald Trump's campaign pledge to step up deportation efforts. They've also approved money for legal assistance and college scholarships for people living illegally in the U.S., and made it harder for businesses and government agencies to disclose people's immigration status. "This comes as a relief that there are some legislators that are really listening," said Pablo Alvarado, executive director of the National Day Laborer Organizing Network. Senate President Pro Tem Kevin de Leon, D-Los Angeles, introduced SB54 shortly after Trump's election to cut off most interactions between federal immigration agents and local police and sheriff's officers. Following sharp dissent from law enforcement officials and Brown's intervention, it was scaled back significantly. The final version prohibits law enforcement officials from asking about a person's immigration status or participating in immigration enforcement efforts. It also prohibits law enforcement officials from being deputized as immigration agents or arresting people on civil immigration warrants. Police and sheriff's officials, including jail officers, will still be able to work with federal immigration authorities if a person has been convicted of one of some 800 crimes, mostly felonies and misdemeanors that can be charged as felonies. But they'll be barred from transferring immigrants to federal authorities if their rap sheet includes only minor offenses. Immigration advocates generally applauded the latest version, even with de Leon's concessions. For them, the bill delivers a rare victory during Trump's presidency, preserving some protections for people in the country illegally and adding others. The bill will prevent local police from becoming "cogs in the Trump deportation machine," de Leon said. "In my view this bill's going to make us less safe," said Assemblyman Jordan Cunningham, R-Templeton. "It's going to protect the criminal at the expense of the law abiding citizen." "If California politicians pass this bill, they will be prioritizing politics over the safety and security of their constituents," Homan said in a statement this week.